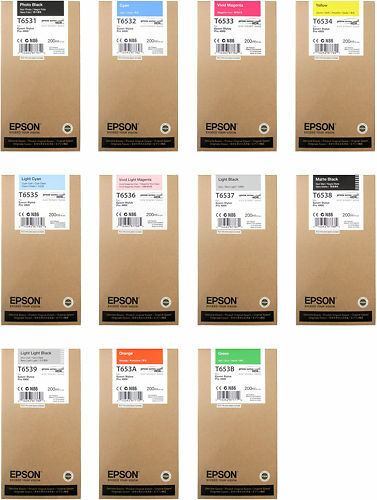 200ml Ink Cartridges of the fantastic, well-tested Epson Ultrachrome HD ink and maintenance tanks for the Epson Sure Color P5070. UltraChrome HD is based on Epson’s famous K3 & HDR ink. It has an aqueous (water based) all-pigment construction that has been designed for professional and commercial print production. The formulation provides an extended gamut from a reduced number of ink cartridges with superior colour accuracy and archival level image stability. Ink dries quickly to produce prints that are water and scratch resistant. The ink set includes Vivid Magenta for brighter blues and pinks as well as Light and Light-Light Black for improved balance with neutral greys, reduce bronzing and minimal colorcasts/colour twist. The HD formulation features improved Matte and Photo Black inks that provide an enhanced Dmax for brighter prints with an enhanced tonal range in both B/W and colour. It also features a new Yellow ink that provides further durability enhancement with increased UV light resistance. 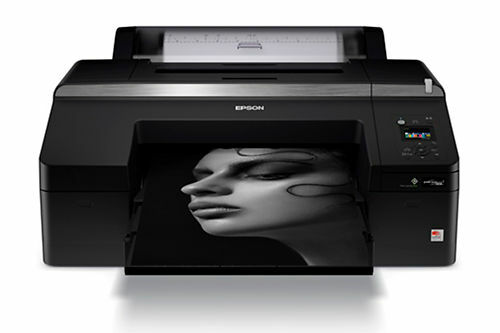 Hand curated articles, links and downloads to help you get the best from your Epson SureColor P5070 Inks.